On Sunday morning we left Echuca for Terrick Terrick National Park, VKFF-630, about three-quarters of an hour’s drive. We have been to Terrick Terrick National Park before and I secured 12 contacts. My aim was to complete the activation by gaining a further 32 contacts to make the 44 required for the WWFF award. It was cold. The air-stream moving over South East Australia has given us our first taste of winter. While the sun was shining the wind chill was quite severe. I was able to gain 48 contacts using both 40 and 20 metres. The action began at 00:27 with a contact with VK5PAS/P5, Paul at Maize Island Conservation Park, VKFF-827. Signals were 5 and 9 both ways. The band appeared to be in great shape. I worked VKs1, 2, 3, 5, 6 and 7. My last contact was with VK7DR, Rob, at 02:22. Rob is located in Oldina, a small town south of Wynyard on the North West coast of Tasmania. My station was a FT897 set for 10 watts, a 40/20 metre linked dipole and a 8.400 amp hour LiFePO4 battery. Thank you to all of you who helped me get 40 contacts, which with 12 from an earlier activation, more than allows me to qualify the Park. After enjoying a number of contacts with activators in Terrick Terrick National Park over the past year or so, today it was my turn to become an activator. I drove into the day visitor area at the base of Mount Terrick Terrick, about one and a half kilometres into the Park from the Southern access point. It is a beautiful spot in a most interesting park. 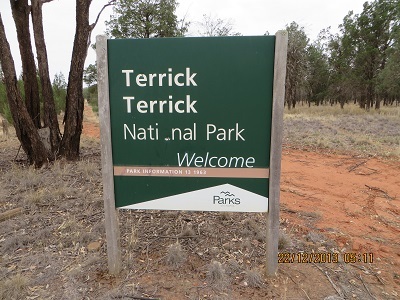 Terrick Terrick National Park was created by gazettal in 1998. Its first ten years was as a State Park. I am assuming that this means it had a lesser status then. 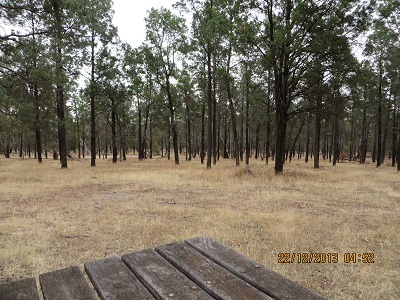 This is the first National Park in Australia’s Riverina bioregion according to the Parks Victoria brochure. What is immediately obvious to visitors is the White Cypress Pine Forest. It was a warm day with high humidity and not unpleasant. Every now and then during my activation there was a light sprinkling of rain, but not enough to be a nuisance. I set up my station on a Park picnic table and had the whole place to myself. My first contact was with VK2TWR/p and QRP, Rod, on Mount Townsend, VK2/SM 002. Both our signals were 5 and 7 at 0330 UTC. I was delighted to have such an enjoyable contact and earn a few more points as a chaser. Then followed VK3SE, Steve; VK5PAS, Paul who kindly alerted all and sundry, thanks Paul; VK5FMID, Brian; VK5KC, David; VK5EE, Tom; VK3XPT/p and QRP, Perrin, near but not in the Wilson’s Promontory National Park. Watch out for Perrin over the next few days as he will be in the Park and activating two summits. I enjoyed quite a chat with Perrin before more contacts: VK5LY, Larry; VK5WG, Nev; VK3JP, Ron; VK5FMID, Brian again and finally VK3FAVE, Andrew from Nyah West, making 12 contacts for the day. I have now activated four Victorian National Parks and am aiming for ten! 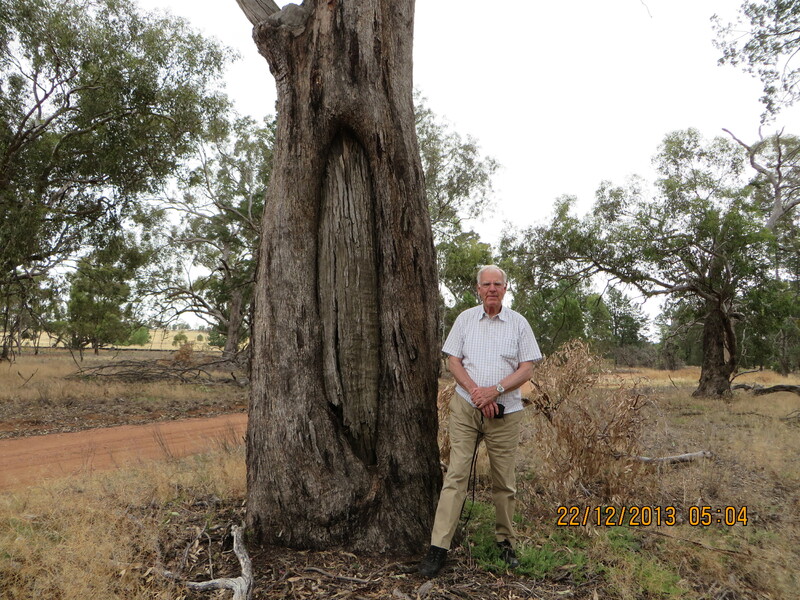 This tree has an identical scar on the opposite side from me indicating that it was perceived as valuable by the earlier inhabitants of this land and, perhaps, that such trees were not overly common in the area.